If you neglect your stuff, you have to work harder to get it back in order. There is bad fear, but there is good fear as well. Once you realize fear is all in your head, it’s easier to overcome it. It took a little date yesterday with George Michael and my dentist to realize how many valuable lessons I’ve learned in life, right there in the chair. It was truly a time of reflection. Let me explain. When I was a young girl, I don’t really recall much about my dental visits other than the fact that they always went really, really well. Cavity-free for years, I apparently had a knack for using my toothbrush. And then I became a pre-teen, and we began preparing for the big B: braces. 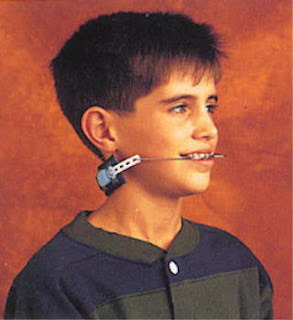 Because this was back in the day and palatal expanders were still an item of the future, I had several teeth pulled before getting my braces put on. During this time, I was subjected to the torture-device of the time, headgear. Of course that is not me. You wouldn’t really expect me to post a photo of myself wearing that thing, would you? (I have some, though.) I felt very ugly and gawky while wearing the headgear, and I also felt like my teeth were being pulled through the back of my neck…but that’s what you’re supposed to feel like while wearing a convoluted contraption such as that one. I enjoyed amazing dental health for several years after that. At the ages of 19 and 18 respectively, Jim and I got married. He was in the Navy and although I do believe we had dental insurance of some kind through the government, I did not go to the dentist for my six month checkup. And then, in six months, I didn’t go again. And then, again. And then, again. And then, again. I don’t remember why I caused this 2-1/2 year lapse; I was never one to be afraid of the dentist. I didn’t have any terrible experiences that would cause fear or dread. All I know is, the longer I stayed away, the greater my fear of returning became. And then, suddenly, the fear of losing my teeth in my early 20’s overcame my fear of a little scolding from the dentist, and I made an appointment. When the receptionist asked me how long it had been, I was ashamed. She said, “Well, I’ll have to schedule extra time, just in case.” I felt like I was five years old, and sheepishly wrote the date and time on my calendar. When D-day arrived, I was ready to “Woman-up” and get it over with. I remember that the cleaning did take a little more than an hour, but–miraculously–I had no cavities. With the exception of a bad wisdom teeth extraction experience in which the dentist (while telling me I wouldn’t feel a thing) physically pulled my body out of the chair as he was pulling one of my teeth–one whose four roots were curved outward like an anchor rather than inward in a neat little package–I had dental bliss over the next 13 years. I was happily maintaining nice-looking chompers. When we moved to this town in 1995, we found a dentist who accepted our dental plan, and things were going smoothly. A couple of years later, he decided to give up his practice, and we met our new dentist via the letter he sent to all of the patients from the practice that he had taken over. When we went in for our next check-ups, we found ourselves really impressed with this really friendly, knowledgeable young guy, Dr. Dentist (not his real name). He laughed alot and explained every single step of whatever he was doing. His love for his chosen career shined through during every single minute, and as we got to know him, we learned that he is a product of the American Dream. If I remember correctly, his mom brought him here from their native country when he was a child, and raised him on her own. While she was raising him, she was getting an education and is now doing very well for herself (Go her!). In the meantime, he was able to go to school for dentistry, and the rest is history. Dr. Dentist was our thirteen-year-old’s first dentist. I remember sitting in the waiting room, listening to the boy (3 1/2 years old) *screaming* bloody murder during his first visit. I remember Dr. Dentist calmly trying to talk my son “off the cliff”, as it were, and after a few edge-of-my-seat moments, the kid got quiet and the exam proceeded. In time, Dr. Dentist notified me that it looked like I would need some gum-graft surgery because of recession: CAUSED PARTIALLY BY MY BRACES. How annoying is that? At any rate, he referred me to a periodontist and I went there for a consulatation, knowing that I had complete trust in my own dentist’s choice for me. Dr. Perio (not his real name) was very, very impressive in the first 60 seconds of our meeting. He is one of these “experts” who has published many things and has been on Oprah, yada yada, yada. So I put myself in his capable hands for surgery. Actually, two surgeries. I had to split the procedure in half due to the scope of the needed repair areas. The surgeries had to be at least six months apart. I may be the only person on earth to ever say this, but, other than the normal discomfort associated with the procedure, my gum graft surgery was fun. I was allowed to bring in a CD (No Doubt: Rock Steady) to listen to, and Dr. Perio and his two helpers danced and joked around while they were performing the procedure. The second procedure wasn’t quite as fun. I started to have a panic attack as I thought about what he was doing as he was cutting into the roof of my mouth. I couldn’t get the thought of it out of my head and my body started to react. It was one of the most terrifying feelings I have ever had (I will be writing about another hopefully next week). I finally pushed the fear away by remembering that this was my second time in this position. The first time went well, and I had total trust in Dr. Perio. I would be fine. Slowly my body relaxed again, and indeed everything went smoothly from then on. Dr. Perio told me that I needed to get a cleaning and check-up every three months now, so I would alternate appointments between his office and Dr. Dentist. 2. He only works 4 days each week (Go, him! Right?) and is open until 7 p.m. on only two of those days. We came to the heart-wrenching decision to switch dentists. We needed an in-network dentist for our wallet, and a dentist that was closer to our house with a wider range of hours for our schedule. The only place that fit the bill was the dental office that is located in one of the department stores at the mall. When I notified my technician at Dr. Perio’s office of our switch, she stared at me with her mouth open and said, “You…what? WHY? Oh my…Are you sure you have to leave Dr. Dentist? He’s awesome…” I felt as ashamed I did when I made my first check-up appointment after 2 1/2 years, so many years ago…but I had to do what I had to do. We weren’t really happy about the change and, in fact, I cried a little bit when I went to Dr. Dentist’s office to pick up our records. I told his receptionist our honest reasons for leaving, and that it was killing me to do so but we just had to. I was so happy. I called Dr. Dentist’s office and asked if we could come back, and the receptionist was thrilled. I made appointments for all four of us and we were welcomed back like family. But all the news wasn’t good…I needed some tooth restoration (read: cavities filled) that would require three seperate one-hour appointments, one for each tooth. Dr. Dentist reassured me that in these cases, it wasn’t my brushing habits that caused the problems; I couldn’t do anything to prevent these kinds of cavities. I don’t know about that, but I do know that I appreciated his effort in making me feel better. For the last three Tuesdays at 2:00, Dr. Dentist, his assistant and I have laughed our way through the procedures. Dr. Dentist loves having all of the newest technology and one of his favorite tools is the little camera. He loves to show the before and after. Last week, at the end of appointment number two out of three, he was getting ready to show me the “after” photo when he said, “You have an angel in your mouth now.” I said, “HUH?” He laughed and pulled up the photo, which showed my new composite (tooth-colored) filling which was, if you looked at it a certain way, in the shape of an angel. (I bet he looks for shapes in the clouds too!) He said, “See? There’s the head, the arms, and the little dress.” I laughed and said that I don’t have any tattoos so this would be a great conversation piece. Yesterday as I got comfortable in the chair, Dr. Dentist told me that he had to do some dental work on his wife earlier in the day and she had brought her George Michael CDs for him to load onto his iTunes in the exam room. Last week, he and I had discussed the fact that Julie and I are going to the concert, and his wife is, too. He put on the George Michael tunes and away we went with the procedure, laughing and debating about who has the better voice, George Michael or Freddy Mercury. I was filled (ha ha) with joy, thinking about all I had learned there in the chair and I knew that, even with a minor side-step off course, you really can always go “home”. What a great story. Good for you for being smart enough to realize it’s worth it. To say that I am terrified of the dentist is really understating it. I will go anywhere, pay anything, to (hopefully) spare my kids that future anxiety. That video is seriously twisted! Where do you find them? It’s funny (ironic that is) we switched to our old dentist after 3 years with a new one. We moved some 40 minutes away from the good dentist and after 3 terrible experiences with the new guy we decided to switch back and make the drive. It is so worth it. I almost had a panic attack reading about having the roof of your mouth cut into. Yikes! Stacey: I actually “Found” the video on purpose. I have been looking for it for ages, because it is from one of my (and Julie’s) all-time fave shows, “The State” on Mtv. The cast (I went to high school with one of them, which is what started me watching!) went on to other projects like the movie “Wet Hot American Summer” and the tv shows “Viva Variety” and now “Reno 911”. “The State” was a hilarious sketch show, and this “Toothbrush” sketch is one of the millions of things that my sister and I quote on a regular basis. Because Mtv has delayed the release of the show on DVD (Season 1 is on iTunes now though), fans are going nuts. I’ve had an e-mail alert on Amazon for when it comes out for AGES now. Joeprah: Yes, I have definitely learned my lesson. You don’t mess with your mouth. Sorry for your near-panic attack! I actually watered down my description greatly because I didn’t want anyone to pass out while reading it, and then hit their head, get rushed to the hospital, and…well, you get the idea. PS: I can’t believe you & Dr. Dentist talked about Freddy Mercury’s voice instead of his jacked-up teeth. Such a cute story, Melisa. Joodie: Good point. Freddie’s teeth were not mentioned at all. I’m going to have to express shame at Dr. Dentist on my next visit with him which, thank GOD, is not for 6 months.